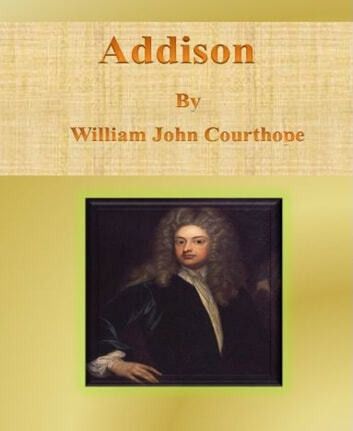 Addison written by William John Courthope. Published by HARPER & BROTHERS PUBLISHERS in 1902. and now republished in ePub file. William John Courthope was an English writer and historian of poetry, whose father was rector of South Malling, Sussex. Of the four English men of letters whose writings most fully embody the spirit of the eighteenth century, the one who provides the biographer with the scantiest materials is Addison. In his Journal to Stella, his social verses, and his letters to his friends, we have a vivid picture of those relations with women and that protracted suffering which invest with such tragic interest the history of Swift. Pope, by the publication of his own correspondence, has enabled us, in a way that he never intended, to understand the strange moral twist which distorted a nature by no means devoid of noble instincts. Johnson was fortunate in the companionship of perhaps the best biographer who ever lived. But of the real life and character of Addison scarcely any contemporary record remains. The formal narrative prefixed to his works by Tickell is, by that writer's own admission, little more than a bibliography. Steele, who might have told us more than any man about his boyhood and his manner of life in London, had become estranged from his old friend before his death. No writer has taken the trouble to preserve any account of the wit and wisdom that enlivened the "little senate" at Button's. His own letters are, as a rule, compositions as finished as his papers in the Spectator. Those features in his character which excite the greatest interest have been delineated by the hand of an enemy—an enemy who possessed an unrivalled power of satirical portrait-painting, and was restrained by no regard for truth from creating in the public mind such impressions about others as might serve to heighten the favourable opinion of himself. Lives Of The Poets: Addison Savage Etc.